When you’re working with a team for a long time, it is important to keep retrospectives sharp. They are just too valuable to let them change into a drag. The team should feel energized to start a retrospective, as it is the time and place to share feelings and let creativity blossom. If all you’re doing is answering the questions ‘What went good?’ and ‘What can we improve?’, things tend to get boring after a couple of iterations. To get some ideas about fun exercises you can introduce in retrospectives, this book by Ester Derby and Diana Larsen is a great reference. Sam Kaner has also written a book with some great tips and tricks you can use during retrospectives or collaborative sessions. 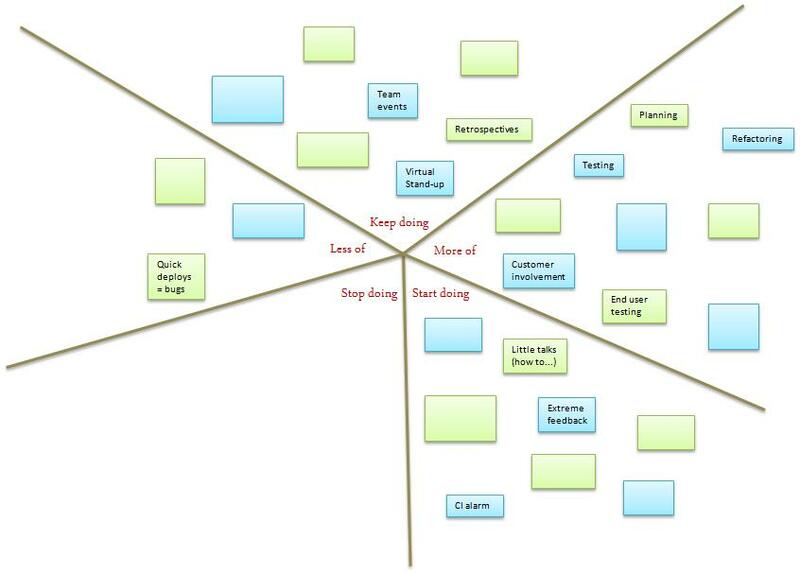 A great exercise I used in one of my previous retrospectives is called the starfish. I discovered the concept in a post of Patrick Kua, one of my favorite blogs. Instead of trying to divide every thought into the 2 classic categories ‘Went good’ and ‘Do better’, the starfish has 5 categories: Keep doing, more of, start doing, stop doing, less off. The main benefit is the change of viewpoint. Because the categories are in fact actions, you automatically start to work more result driven, instead of stopping at discovery level. For example, if you didn’t like the length of the demos, you can write a post-it ‘Timebox demos’ and hang it on the ‘Start doing’ section. I was amazed how much new stuff was discovered thanks to this change in perception. Here is the result of our starfish exercise (I blurred most of it to keep it confidential). Thanks for the idea Nick – I like it and will try it out at some point. Hi Nick – Thanks for sharing – I’m trying it this afternoon! Our team is functioning pretyt well, so buildling on the starfish theme, I got some beach-related party favors, even found Message in a Bottle invitations to use – just to keep it fun! Even though it is an interesting idea, it is definitely not for every team. In my experience our former PM was doing different activities in every retrospective and each and every one of the team members hated them and in most meeting there would not be a lot of ideas to work with. After a few months, she went on to other things and the new PM was of the traditional “what went wrong?” and “what can be improved?” kind of retro and you would be amazed at the amount of feedback the team would come up with. So, in a nutshell, you must do what it works and in order to do so, you must know your team.